A female Greater Sage Grouse making her home in the vast sea of sage near Walden, CO. These birds have very unique dance and song. Hi, yes they do and unfortunately we did not get to see any mating displays. That would be quite a sight. Hi Eliza, they are sure hard to spot once the slip back into the sage. Much of the sagebrush habitat is indeed being used for oil and gas exploration and this is a serious threat to these guys. What beautiful birds these are! Hi, I have to agree with you. I always marvel at how well camouflaged species can be in their given environment. What a marvelous feat that is. I just love the look of grouse and quail. Part of it is that they are so well camouflaged, yet so intricately gorgeous. I agree that camouflage is so perfect and seems to adapt to subtle differences in terrain. Amazing. What a gorgeous bird, Mike. Great shot. Thanks Jane, these guys are one of my favorites. So hard to spot once they slip back into the sage. Hope you have a great weekend. I have never seen one. 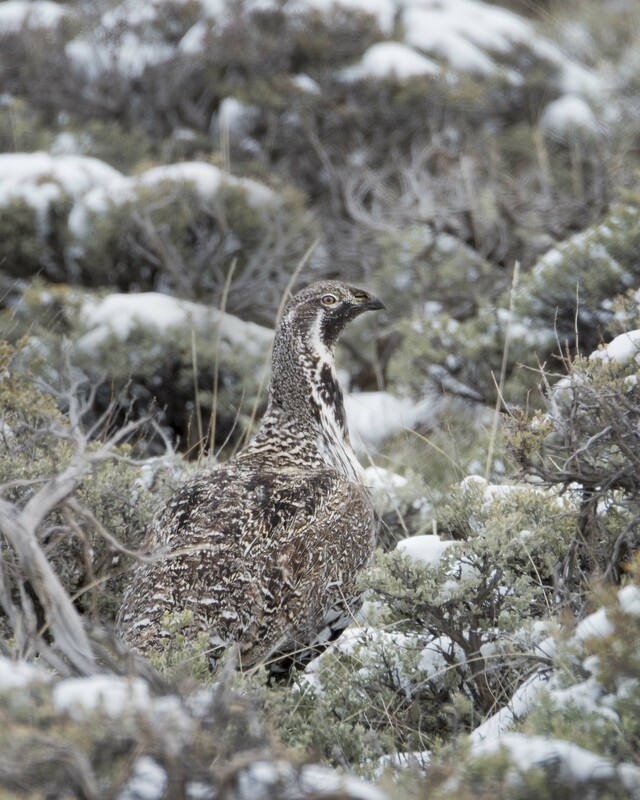 Bill, my husband does a lot of work around the Gunnison area to restore habitat for the Gunnison Sage Grouse. They are amazing too. He may be doing more for the Greater at a later time. He is working with the Nature Conservancy, Forest Service, BLM, private ranchers and other groups as a collaboration effort to save them. Nice shot of this beauty! Hi Mary and Give a thanks to Bill for his efforts in helping restore the habitat for the sage grouse. They came remain so easily hidden the sage they are sometime hard to see. We were lucky to see this lady. I love the sagebrush habitat and the vastness of it. Hope your weekend is going well.